Here we are at the beginning of another year. Often, whether we want to or not, we reflect on the year that just passed. We can either be happy about it or sad about it — whatever. But, as we go into 2016, we can decide to tip the attitude scale away from negativity and toward positivity. How we look at a bad experience (or a loss) changes when we focus on the good that might come from it. I’ve been thinking about certain women who had something in common with me. I started with a woman I knew as Mrs. Carter. She was the mother of my oldest friend, and my mother’s BFF. Mrs. Carter was also the first person I’d known with Stage 4 cancer. You see, I was diagnosed with breast cancer in 2008 when Mrs. Carter was in her seventh, and final year, of her battle with ovarian cancer. We went through chemotherapy at the same time. Because of this experience, we related to each other in a way that only cancer patients can understand. Mrs. Carter was my touchstone for how to live graciously with a chronic disease. Fast forward to 2015… I knew three more women who were Stage 4. Two had metastatic breast cancer; and one, a close friend, had squamous cell oral cancer. All of them died this year. Before you think, ‘Damn, this post is by Debbie Downer,’ just bear with me. I have to put my chatty, witty posts about great food and travels and my occasional witty rants on pause for a bit. Sometimes bad stuff will remind us of things for which we should be grateful. My gratitude is not “Thank God it’s not me at Stage 4.” It’s gratitude for being witness to the grace these women had as they faced our common adversary, Cancer, to the end. Ever since I was diagnosed with cancer, I’ve been referred by friends to other women going through the same illness. That’s how I met Rhonda and Lisa: we all had tennis and breast cancer in common. Rhonda and Lisa never met, but each came into my life on the same day for the same purpose — through mutual friends, who wanted to introduce one breast cancer survivor to another. Lisa was already in Stage 4 when she was diagnosed with breast cancer. We met for lunch through a tennis friend. Lisa was in good spirits when we met, but admitted her own doubts about whether she’d reach her 50th birthday. She told me about the extravaganza 50th birthday party she’d hosted that year when she turned 49. Lisa hung on most of the next year. She almost made it to 50, but died a few months shy of her birthday. Rhonda and I met for dinner through another mutual friend on the same day I met Lisa. Rhonda was a Stage 2 survivor, who’d had the same diagnosis as I. But, Rhonda chose to treat the cancer only with surgery and forego the rest of the treatment protocol of chemo, radiation, and five years of a hormone drug. After she healed from her mastectomy, Rhonda quit her job with a Florida newspaper and became a freelance writer. She pursued her dream to live abroad for at least a year, starting in Costa Rica. Rhonda’s sabbatical was cut short last January when pain sent her to the hospital. The doctor diagnosed her with metastatic breast cancer. Every time I thought about Rhonda, my thoughts would turn inward and I wondered if I’d be going down this same path one day. What scared Rhonda was scaring me, too, only I wasn’t living with it. Rhonda wrote a couple of poignant pieces about her diagnosis and living with metastatic cancer here and here. Her theme was the strength of surrender. Rhonda’s own words were her guidepost for living. Rhonda and I stayed in touch and followed each other’s blogs. From time to time, she would reach out to me for health advice. In 2015, Rhonda became a certified life coach, and she enjoyed spending lots of time with family and her boyfriend. She was also present for every life milestone achieved by her loved ones. Rhonda continued freelancing for on-line publications, sometimes inciting controversy. She had a classy way of shutting down ugly comments from fools. And, among other things I learned about Rhonda, she was fearless when it came to her convictions. 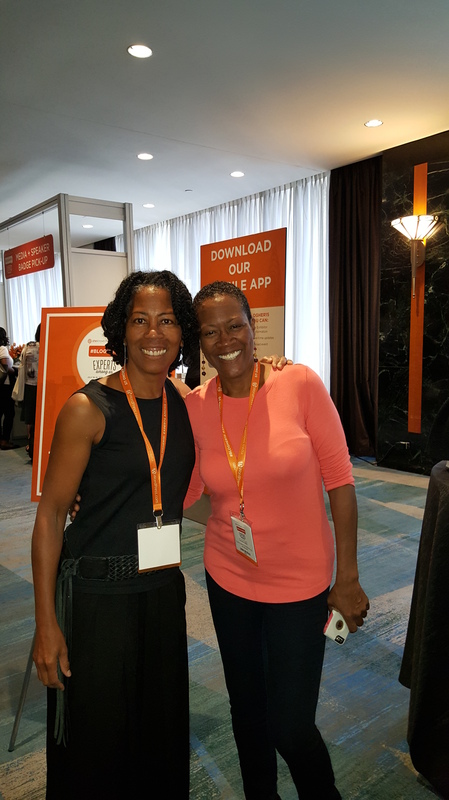 My sister and I ran into Rhonda at the BlogHer15 conference in New York. I remember Rhonda’s response to a loud, boisterous group of women in the middle of the lobby. Even as she flinched at their behavior, she said, “Hashtag (#)nohometraining.” That’s a quick wit. I reflected on Rhonda’s message and noted that she literally continued to put one foot in front of the other and move forward. I told her I hoped she’d find a successful alternative treatment. I made a mental note to offer help with her spiritual conference. Rhonda died right before Christmas, less than a month later. I only knew Rhonda a short time, but I’m grateful for what she reminded me — a cancer survivor — about life. Stay in the moment and cherish each one. Show grace when things appear to not be in your favor. Truly keep living. This post is dedicated to Rhonda Swan — journalist, author, blogger, life coach, and awesome spirit. If you live near Pennsylvania Amish country as I do, the National Christmas Center Family Attraction and Museum in Paradise, PA, is a perfect way to kick off the Christmas season. A self-guided tour through this museum delivers history, culture, tradition, fantasy and faith to showcase Christmas throughout the world. When you enter the museum, you see life-sized vignettes of American family celebrations of the holiday. The cultural reference points include jolly Santa, children trying to sneak a peek at Santa, children tearing open presents with delight, and the traditional Christmas tree topped with a star. These images — part of our national consciousness — actually date from mid-20th century American Christmas celebrations. You (or your parents) might be catapulted back to these very familiar moments. In the corridor leading to the museum proper, you are treated to an exhibit of the history of Santa Claus. Santa is derived from St. Nicholas, a Turkish bishop known for giving gifts to the poor. St. Nicholas was depicted wearing his bishop’s miter, a tall conical hat. As the legend of St Nicholas evolved to Santa Claus, the clothing and depiction changed, too. Some images are of an ugly, gnome-like creature, while others are both ugly and disturbing on many levels. Dare we say the forebears of Santa — the beloved icon — looked creepy? The Dutch, the Belgians, and the English all added or subtracted elements over the course of Santa’s evolution. You will be fascinated with both the images and the history. One of my favorite exhibits was the crêches (nativity scenes). I love these because they demonstrate that Christianity is celebrated all over the world with each culture injecting their own race, nationality, and heritage into their understanding and depiction of the story. Indeed, it is easy to see the manifestation of God’s gift to the whole world through these crêches. I was taken back to an era when a Woolworths 5&10 store was the nerve center of a community. Lancaster, Pennsylvania was the home of the original Woolworth’s. The museum has a replica of the store’s Christmas section. You can walk around the space like a shopper and marvel at the cost of trinkets, decorations and gifts from back in the day. In the museum proper, we find Bob Cratchet and Tiny Tim from Charles Dickens’s, A Christmas Carol. From there, you can wander through one “country” after another, approaching a front door, looking in a window, and being transported to Christmas celebrations in other times and places. There are a variety of Christmas trees, decorations and depictions of Santa and other figures important to the season. Vignettes are captivating, inviting you to return for another look to see what you may have missed. Be warned, this could take you into serious visual overload! The wonderfully curated vignettes match sounds — music, animals, Christmas carols, or spoken word — with the scene. Santa Lucia – St. Lucy’s Day is celebrated in Scandinavian countries during Advent. Moving on, you find Tudor Town and delight in the animals’ storybook Christmas. As you move through this exhibit, you can read the story and see the characters in charming vignettes—pure fantasy. Your inner child will approve. While all the fun and delight of Christmas is great, it’s easy to forget the point of the celebration. The next several rooms set the stage for Christ’s birth, beginning with “O Holy Night,” a life-size panorama of the desert and the travelers at night. You begin to quiet inside, letting the images seep into you. After “O Holy Night,” you are back in daylight experiencing a walk through Bethlehem and the market place. You look inside the type of dwelling Mary and Joseph would have called home; and realize they were in the Middle East. Think about it in light of current events. I did. The curator did a fantastic job of making this transition and leading us into “the Holy Land.” The mystery and wonder begin to envelope you. You remember the Christmas story as it unfolds in front of you: the angel appearing to a shepherd; the good news heralded by horn; and Mary, Joseph, and Jesus in the manger. The tour doesn’t end here, but the Christmas story does. You have reached the apex. Winding down, you are shown gifts and ornaments from different cultures arranged as if in a small boutique. There were lovely things, odd things, some you would expect, and some you wouldn’t. Two displays, in particular, struck me as almost heretical for today’s consumer. Did you know that cartons of cigarettes were popular gifts in the ’50s? And, did you ever see an advertisement for the gift of a gun? The National Christmas Center Family Attraction & Museum has something for everyone and is worthy of an annual pilgrimage, if you can make it. It is open most months of the year, and now…well, ’tis the season! You can enjoy the museum with or without kids—though the teachable moments with kids are numerous. You will experience nostalgia, hope, and the realization that there are common bonds among all peoples. I had already written a three-part series on “Getting Around Europe” based on my recent travels to Paris, Brussels, and Amsterdam, when Paris was attacked by terrorists. I decided the timing was wrong for publishing these posts. They might seem frivolous in the face of world-wide shock, and the suffering of those living through this ordeal and those who lost loved ones. Then, I thought of what I’m trying to share in my posts — that travel is a good thing, and there are many marvelous places in the world. Paris happens to be one of them. No acts of terrorism can change that. Inevitably, some people will think the world is too unsafe and unpredictable for them to leave home. Or, they might think Paris is particularly unsafe because 2015 opened with the Charlie Hebdo terrorist attack and closed with more of the same. Some of my sister’s friends know she is going to Paris in the spring and asked her to reconsider. She won’t, and I don’t blame her. Unless there is a State Department warning or alert, we would not hesitate to return to Paris. These terrorist attacks could happen anywhere. Cheryl and I talked about the relative danger here in the U.S. Do we tell kids and teachers not to go to school because there might be a mass shooting? Do we decide to work from home because our office building might get bombed? Do we forego Bible study at our church in case someone in our group will open fire on the rest of us? Do we stop training for, and running, marathons because they might end in bedlam and carnage? Terrorism and hate crimes have happened here, too. You can’t stop moving, living, or experiencing regions and cultures because of these frightening events. There’s a reason why they are called acts of terrorism. When dealing with adversity, resilience trumps all. Resilience is already evident in Paris. The people there are determined to press forward in the act of living, even though they’ve been asked to remain indoors. They mourn and stand vigil in various places around the city. And, eventually, Parisiens will regain their trademark joie de vivre. They know that if they give in and give up, then terrorists win after all. Aging — it happens every minute of our lives and starts at birth. Aging — it can neither be denied nor held at bay, not even with alluring products and superfoods that claim “anti-aging” magic. In developed countries, we’re living longer, but that doesn’t necessarily mean it’s going well. Let’s aim for living and aging well. I wonder all the time how well will I age, and what kind of old person will I be? From observing people around me — and remembering the people I no longer see — I figure that how well anyone gets on down this road is partly in their control, and partly a crapshoot (including the vagaries of the gene pool). My mother, on the other hand — “Ms. Daisy” — is still vibrant in her late 80s, having adventures of her own. I also know a certain nonagenarian, who’s closer to 100 years of age than not, who recently went on a Panama Canal cruise with his younger girlfriend. My three siblings and I share this gene pool and it’s not clear yet how things will go for us. It seems that I’m the one with some kind of weakness, having had major surgeries of the back, abdomen, and breast at a fairly young age. But, so far so good for us all. Don’t underestimate old folk or write them off. I was in my 20s when I faced an unlikely opponent in a tennis tournament. She walked slowly onto the court wearing surgical stockings and a thin sweater, like she had a chill. She carried only her racquet, not a tournament bag full of gear like the rest of us. To me, she looked old as hell. I thought: ‘I’ve got this. I’ll overpower that old lady and run every ball down.’ Old Lady had a different notion. She planted herself in the region of the court called “No Man’s Land” to return my serves and ground strokes. (Few people have the skills to play an entire match there.) Old Lady took all my balls on the rise and yanked me from corner to corner. Hardly moving from that area the whole match — and certainly not breaking a sweat — Old Lady ended it with ruthless efficiency. I was running balls down all right, many of which were out of reach. Old Lady waxed me with wisdom. The other aspect of aging is accepting and feeling positive about physical changes you cannot help without surgery. I’m not a fan of plastic surgery because I don’t want to have “puppet-face.” Besides, it’s a waste of money; gravity wins over time. Speaking of which, looking down in a mirror revealed to me gravity’s effects on my face and neck. I was, like, damn…. Anyway, there are a lot of things to come to terms with as time marches on. I’ll embrace the aging process because I’m happy to be here, and I’m still me. There’s always some wise person to remind us that growing old beats the alternative. How do you see yourself in your Senior Years? Making its debut in Spring 2015, American Womankind was a delightful surprise, speaking to a hunger I didn’t know I had. I needed smart, engaging, and thought-provoking writing every bit as much as I craved visual pleasure. Womankind has both. Born in Australia, Womankind intrigued and seduced me at the cover, a butterfly encrusted portrait of Simone de Beauvoir, the French feminist philosopher and long-time companion of Jean Paul Sartre, French existential philosopher. Composed of thousands of tiny butterflies in varying colors and patterns, the portrait hints at the theme of the spring publication. If you think about the life cycle of a butterfly, you can imagine the process of transformation that is part of all life. Like butterflies, we are in the process of becoming. What will we become? What roads will we travel to get there? With what will we identify? Womankind invites you— without carping—to examine the life you lead, to learn something about women in history whose stories you may not have heard before, and to live more mindfully on the planet. There’s both strength and delicacy in the delivery of essays like: “The Celebrity Machine,” Cooking As Meditation,” and “The One Story That’s Changing Your Life,” framed with startling art, photography and graphics that relate to the articles. Womankind’s well-written essays explore topics and people in a way I haven’t encountered before— and in a format that invites my curiosity and engagement. Fresh perspectives from artists and writers, concerned with different aspects of the same topic, were paired in such a way as to resonate with my own thinking. I was not just informed, but enlightened; affirmed, as well as supported. I feel that my ability to look at myself individually and as a member of society is respected by this magazine. The lack of advertising invites me to see myself as something more than a consumer. Finally, the magazine inspires as it celebrates women in every aspect of life through art, prose, and poetry. My second issue of American Womankind arrived with Frida Kahlo, the Mexican revolutionary artist and wife of artist Diego Rivera, on the cover. This time, the portrait was composed of a miniature garden of brightly colored flowers. Again, I was struck by the quality of the content. One essay, “Frontier wars,” by Todd Miller, explored the impact of immigration laws on ordinary people who just want to do ordinary things like take their children to visit grandparents. Regardless of politics, one can’t help but be touched by this human interest piece. If you’re looking for an intelligent, though -provoking, and visually-engaging magazine, try American Womankind, available at some Barnes & Noble locations, or at womankindmag.com. Attending a blogger conference in 2015 was on my to-do list. 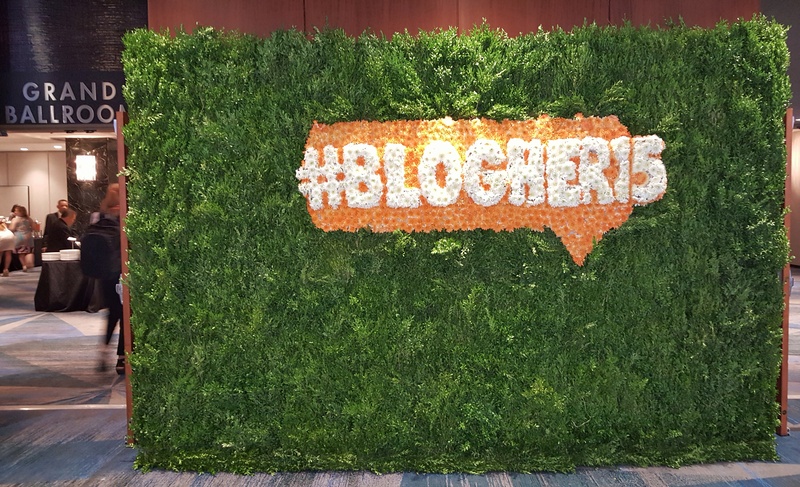 I did some research and found BlogHer15 — a conference that supports women bloggers. It would be in July at the New York Hilton. My sister, Cheryl, and I go to New York every summer, so this was perfect for the geography and my hotel points. As always, we balanced our activities. We bookended the conference with hang-out time in the City and with family. First things first: BlogHer15’s theme was “Experts Among Us.” I had no idea what to expect. Blogging has become quite an industry. I was excited to dive deeper into our blogging venture and share the experience with Cheryl. 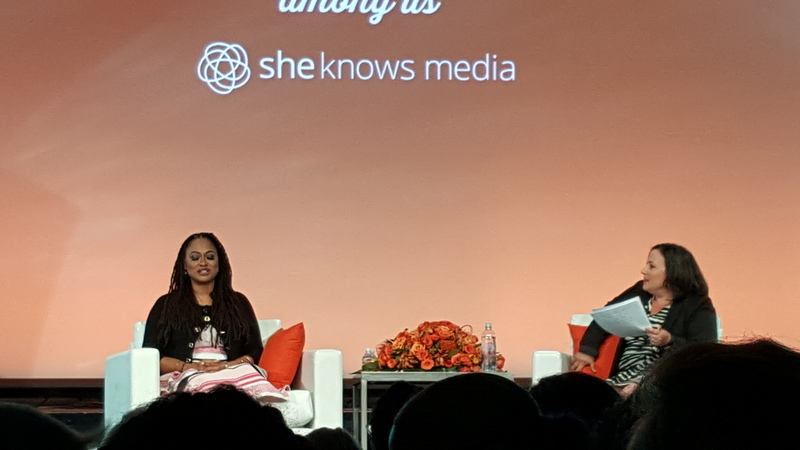 SheKnowsMedia masterfully rolled out the BlogHer keynote speakers and workshops in the months leading up to the conference. I was uncertain how I would fit in with established bloggers because this blog is young, and yet-to-be-monetized. Cheryl was apprehensive about the social and networking aspects of the conference. I hoped the conference would kickstart relationships with other bloggers. I don’t know how many bloggers attended BlogHer15, but it seemed like easily a thousand. 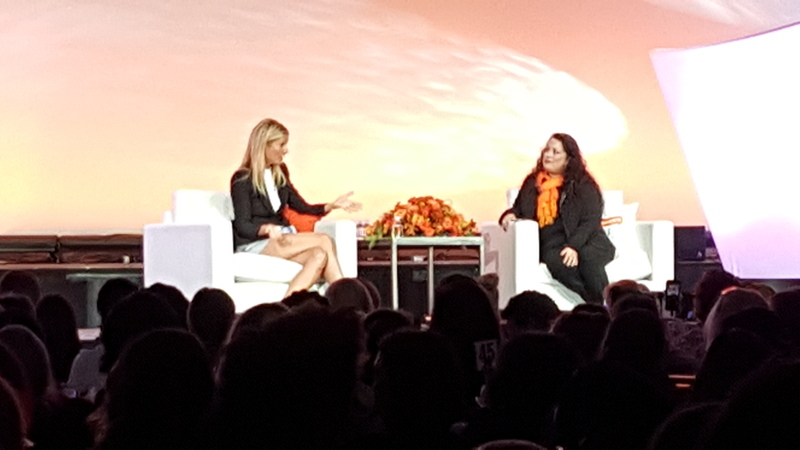 BlogHer15 was a professional, unexpectedly balanced production. It doesn’t mean the conference was perfect because I saw some missed opportunities to help bloggers connect with others in their blogging genre. Nevertheless, there was plenty of substance there for everyone. Presenters and Keynote speakers were similarly diverse. 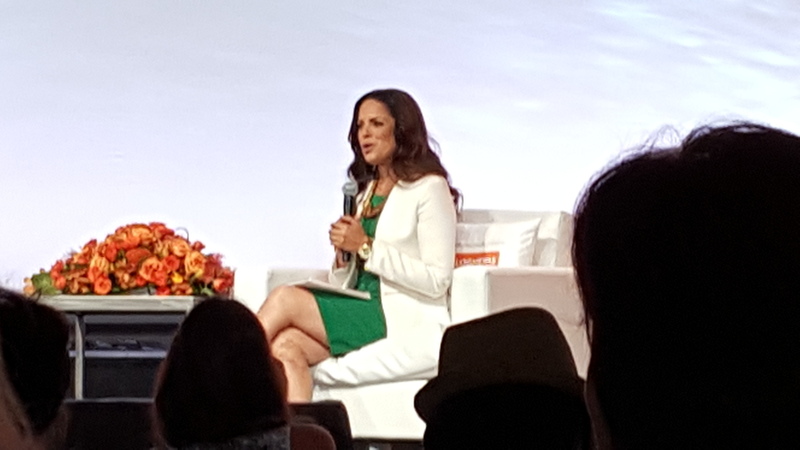 To name a few, we had Ava DuVernay (award-winning director of “Selma”), Christy Turlington Burns (former super-model and founder of “Every Mother Counts”), Soledad O’Brien (journalist and philanthropist), and Gwyneth Paltrow (fellow blogger, actress, and author). Sponsors were diverse: financial, food, personal care products, household products, baby products, technology, and health and wellness. One of my favorite sponsors was Jet, the shopping club that boxed up the swag we picked up at the Expo, and delivered it to our homes. Other favorites were WordPress (their “Happiness Engineers” provided technical help with blogs), and Depends, which hosted yoga classes early each morning. All sponsors gave away swag. Swag, swag, everywhere! “Experts Among Us” wasn’t only about the luminaries among presenters and keynote speakers; it was about blogger attendees, too. We were asked what was our expertise. I gave this some thought. I’m expert in personal transformation. I had a life-changing event and made lifestyle changes that, seven years later, are still evolving in a positive way. This kind of change is difficult to start, let alone maintain. People ask me for advice all the time. I’m claiming this expertise! We were in great company with many accomplished women. Last, but not least, a few words about The Big Apple and how Cheryl and I enjoyed the City. Flower District – green space in a non-park environment. Before we checked into the conference, we had a mission on the Upper East Side. That mission was to hit the two Roundabout designer consignment stores. After we scored some very cool items at the semi-annual sale, we enjoyed a long walk back to the hotel. Cheryl nonchalantly photo-bombed the sculpture. We dined in Harlem at Barawine (Lenox & 120th) — delicious! We walked a few blocks from there to the Richard Rodgers Amphitheater in Marcus Garvey Park where we saw a jazz singer and her trio, followed by Classical Theatre of Harlem‘s production of Shakespeare’s, “The Tempest.” I hadn’t seen the play before and agreed with reviews that the acting was superb. Classical Theatre of Harlem produces a play each summer at Marcus Garvey Park that attendees can see for free! Our final highlight in NY was brunch at Cocotte in SoHo with my nephew / Cheryl’s son, David. I had the fluffiest, most divine (and expensive) scrambled eggs, potatoes, and peach bellinis ever! True French cuisine is worth it (as an occasional treat). K&C – sister bloggers on the loose! And, I’ll close with a final image from New York….